The English language owes many of its conventions to the German one, but we unfortunately did not inherit the Deutsch proclivity for compound words — the ability to name something or someone or some action with incredible specificity, no spaces required. Martin Kippenberger was an outsized personality and friends coined an outsized word for him: Zwangsbeglucktertum, someone who forces other people to have fun. Emphasis on force. If you were going to spend time with the artist, you had no choice but to belly up to the bar and accept the fact that at some point in the evening, your companion would end up dancing atop a table with his trousers around his ankles. Either live the chaos or stay out of the way. By all accounts, Kippenberger was crass and rude, excessive and out of control, perpetually either drunk or hungover. It’s appropriate, then, that you can find an invitation to a party that advertises “acid gratis” in an atmosphere of “kerzen und matratzen” (candles and mattresses) in his sprawling body of work. Kippenberger’s art and life had the same anarchic energy, both unable to be contained by a single style, medium, or area of focus, bouncing between the eighteen or so cities he called home. He loved rock ’n’ roll and played in a No Wave group called Luxus, and, for a time, managed the iconic East Berlin nightclub SO36 just as the scene was tipping from punk to New Wave. He organized exhibitions and film festivals, and ran what he fancied to be a German version of Warhol’s Factory, called the Büro. Sometimes he made his own paintings. Sometimes he hired someone else to paint. He wanted to be an artist, a museum director, a novelist, a movie actor, a nightlife impresario — and, to his credit, at points he was (or seemed to be) each of those things. A major material and conceptual through-line of Kippenberger’s career is the work about the work: the dozens and dozens of advertorial posters, flyers, and postcards he made to promote exhibitions, performances, and publications, both mocking and mimicking the machinations of the art world. At some point in the 1980s he began collecting this ephemera in portfolios. This photocopy is from one called Mut Zum Drunk (Courage to Print). SFMOMA has dozens of these prints in the collection, many of which are examples of stunning and innovative design. When I worked at Philadelphia’s Institute of Contemporary Art in Philadelphia, one of Kippenberger’s prints hung outside my office, a document of Kippenberger’s first solo show in the United States (at that museum in 1989). The striking fuchsia and red screen-print of precipitous stairs and an abandoned baby carriage was a daily reminder of the ways in which artists and art museums can be collaborators Still others are produced with other artists — one of my favorites engages Christopher Wool and his reliably striking black block text. This unassuming photocopy isn’t notable in the same way. It isn’t without its charms, though. 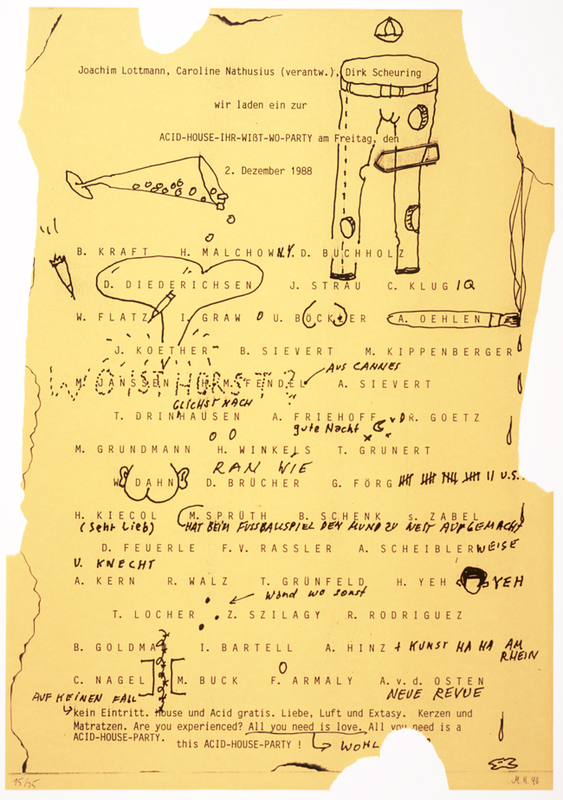 I neither speak German, nor am I intimately familiar with the social politics of the late ’80s Cologne art world, yet I’m still certain that Kippenberger’s many annotations on this document are both irreverent and intelligent, running commentary on the whos and whats involved. There’s a heart around Diedrich Diederichsen, a long-time fan of Kippenberger’s, and the event seems to be hosted in part by Dirk Scheuring, then the editor of the pop culture magazine Spex. Other of Kippenberger’s fellow Junge Wilde artists appear on the list. There are holes drilled through disembodied legs, a nod to his Familie Hunger, itself a nod to Henry Moore, and pills spilling across the page, a nod to, well, taking pills. Was this used as actual promotional material? Or were the annotations added later, perhaps at the Acid House? What does this even advertise? “All you need is love.” It’s a simple Xerox flyer, but blown up to ostentatious poster scale. Engaging with Martin meant agreeing to participate in the theater of his life, and his best performances came in between the works themselves, unruly ephemera as stage. We’re often discouraged from invoking biography in our understanding of artists, but ignoring Kippenberger the man would on some level be to ignore his work altogether. Someone once said to me, “there are no great Kippenbergers, but Kippenberger is a great artist.” I do not agree, but I know what they meant. It’s why I celebrate this cheeky Xerox as much as the sprawling installations, as much as the faux subway entrances in the Yukon, as much as the intimate and expressive Hotel Drawings. Thanks to Mark Owens for reigniting my interest in Kippenberger with his talk “Conjuring Kippenberger” at the Institute of Contemporary Art, Philadelphia, adapted from a chapter in his forthcoming text, Graphic Incognito: Design, Material Culture, and Post-punk Aesthetics, wherein he claims Kippenberger for the design world.